For many beauty queens, winning a pageant title means a change in career path when the bright lights of fame and fortune beckons. 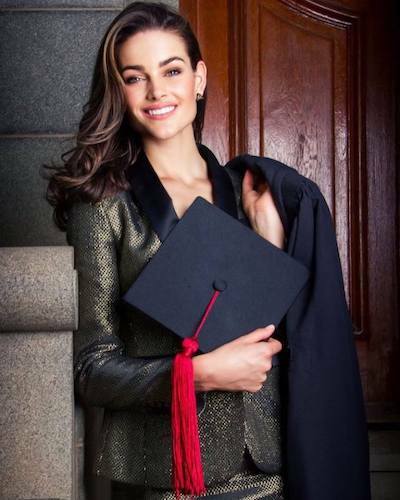 Rolene Strauss put her medical studies on hold for a year when she won the Miss South Africa title in March 2014, vowing to return when she completed her reign. Destiny had a different plan for her and in December 2014 she had to postpone her studies for another year when she was crowned the 64th Miss World. Once again, she vowed again to complete her medical studies despite opportunities coming in that could have sent her life on a different path. She held firm on her decision and returned after giving up her crown and completed her studies at the University of the Free State in Bloemfontein. Earlier this week, she proved that she has always been a true beauty with a purpose when she graduated as a medical doctor. The best of all: during these two years, she also became a Mrs. and had a baby boy. Proving to the World that women can do it all - Dr. Rolene Strauss!